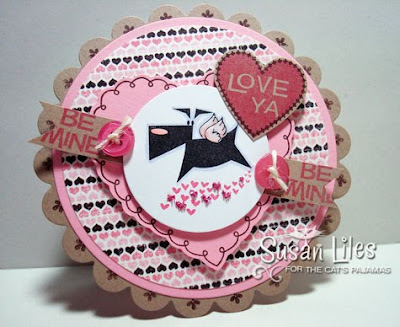 It's a Kitty Kat Pack/Valentine Blog Hop! Well, I'm here to KICK OFF the Kitty Kat Pack Blog hop for The Cat's Pajamas! I'm so excited to share with ya'll what TCP is offering for the Kitty Kat Packs this month to help start your projects early for Valentines Day!! 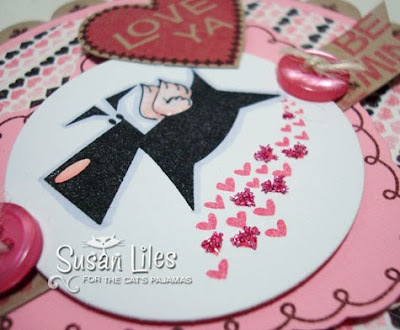 PLUS the new swanky Sweet Thing Valentine Glitter and Buttons! It's the PURRRRRFECT PACKAGE to get you started thinking about L-O-V-E!! Susan--that's me. I hope you know you're here! Also, don't forget, it's "close enough" to TCPTUESDAY and I'm the Hipster Hostess with the Mostess, so here's all the info on how to play along this week: Let's use our TCP Valentine stamps we already have and make a Valentine card to get us in the MOOOOOD!!! --All challenge entries will go into TCP's monthly Swanky Stamper contest. This means $25 in Cat Cash for the winner to spend on new stamps from The Cat's Pajamas! --Link your creation to the slide show/guest book on Alma's blog so that we can all see it! --TCP stamps are not required (unless the challenge is a STAMP challenge from Susan when specific stamps are required), but are of course highly recommended. --If you'd like to also upload your piece to Splitcoast Stampers, use the keyword TCPTUES93 for this week. SUSIE Q-TIP: Before inking up Sprinkle or Poochie here, make sure your black inkpad is nice and juicy. I reink it almost every time I use one of these images. Just remember to heat set it if necessary, so you don't smear it. Don't ask me how I know this. I don't want to talk about it. I think I can guess how you are so wise about heat setting inky images, and I understand your desire to forget it. Your valentine is cute, cute, cute. SUSAN -- adorable!!! Love your cards!!!! That is soooo sweet! Love that Poochie image and the glitter! So love this, woof woof. I love this card! This is the cutest thing ever! It makes me want to buy everything to make the card! You did an outstanding job and I'm just tickled at how cute it is! Soooo adorable! Love the choice of colours and paper! What a cute image and I love the tiny hearts too! The sentiment inside is precious! Oh wow is that adorable! 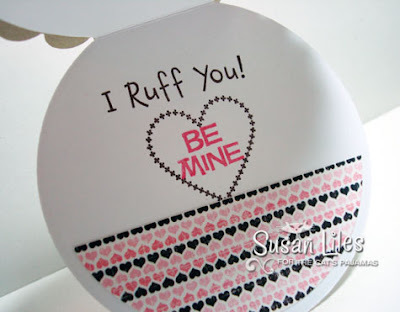 LOVE the circle shape, the patterned papers and that super cute doggie.